Drops of water were falling from the sky – play or not to play? Karen says, “play”. No motor vehicles (including carts) were parked between the white lines in the parking lot – course open or not? Karen says, ” we will have the course to ourselves, let’s play”. Sign on the door of the building in the parking lot – closed for business.Karen says, “hmm”. Did all the negative vibes deter us from playing today? Of course not. We noticed another sign that stated the pro shop was on the lower level and the public was welcome. Indeed, they were open and thanks to my ever-positive wife, we decided to give it a go. As I placed my peg in the soggy ground at Hole #1 the sun came out and we were the only golfers on this outstanding 9-hole course. Sweet!! Hole #1 is a picturesque opening par 4 with trouble left on the drive (and/or 2nd shot). It has a generous green that accepted my third shot. There is no room behind the green so make sure you don’t go long. I sloshed my way to an opening bogey. But we are playing golf! Hole #2 – Par 3, 145 yards. Take the road less traveled! Hole #2 is an awesome par 3 of 145 yards. If you clear the creek, you are on your way to a par. If you are looking for a little adventure you can choose between two ways to cross the creek. The easy way – use the traditional bridge; the adventurous way – proceed carefully over the fallen tree trunk. Karen took the traditional route; I chose the road less traveled. A wide-open fairway greets you at the par 5 third hole. Don’t be fooled by the flag that is staring at you straight down the fairway. That flag is for Hole #5. This hole is a dogleg right with a creek that can affect your 2nd or 3rd shot. 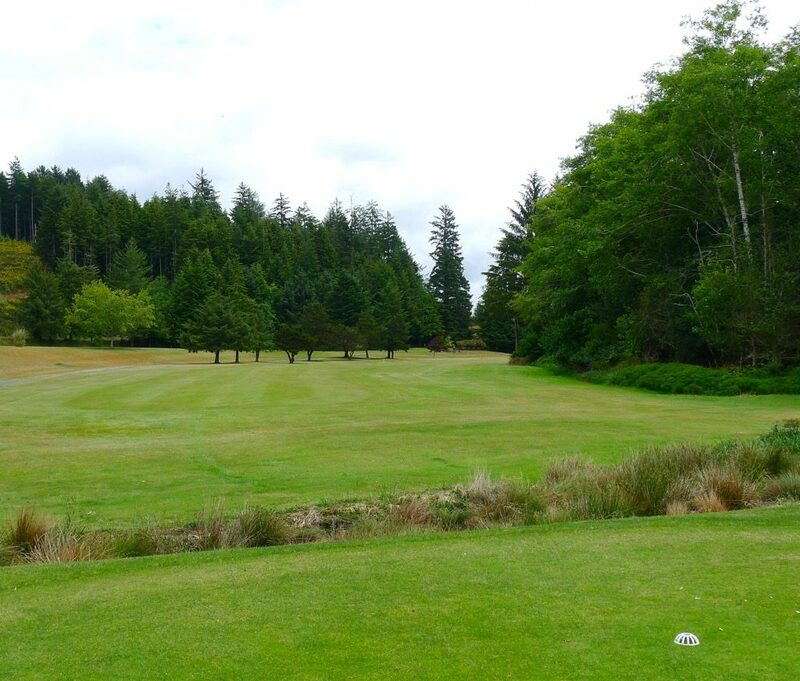 Even though there is tree trouble down the right side, your tee shot will play better down that side. 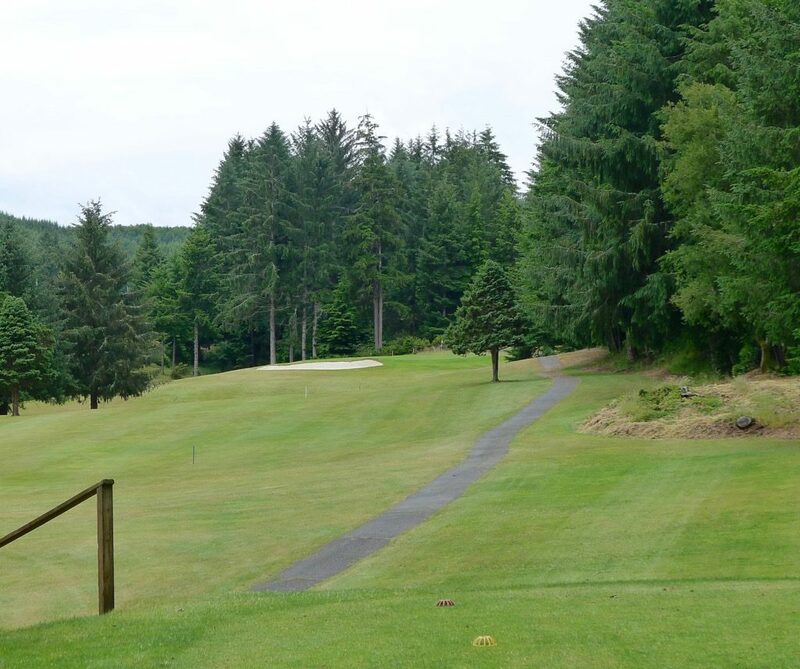 A large tree sits on the left side of the fairway that could cause trouble with your 2nd shot. Hole #4 – Par 4, 295 yards. A big slice works great here! You need to bring out your best fade (slice) at Hole #4. The shot needs to move left to right (but not too far right) to somehow work around a tree strategically placed in the fairway, but miss the bunker guarding the front, left side of the green. Another fun hole and another bogey. By the way, the greens are large, fast and awesome. A deer sighting plus a flock of swallows attracted our attention at the fifth hole. The swallows constantly dive-bombed our cart and fairways the rest of the round. They were a bit of a nuisance but since I parred my way home, who am I to complain? The “S” shaped fairway was the perfect hole for my slight fade. Hole #6 is a 164 yard par 3. From the tee box it looks as if there is tree trouble down the right side. If you hit it far enough there is plenty of room for a miss on the right side. But since it is a par 3, your tee shot should be sitting comfortably on the putting surface – correct? Hole #7 is another spot for that slicer/fader among us. Ho hum, another par on this dogleg right par 4 of 378 yards. 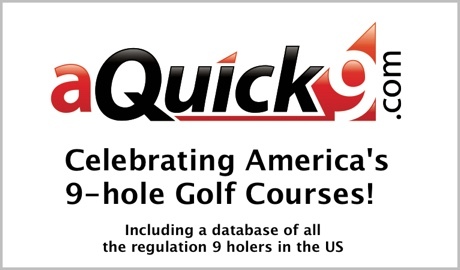 Hole #8 presents all kinds of trouble for the average golfer. A dogleg right par 5 with trees down the right; driving range (and deer today) down the left; and for good measure a hidden bunker about 200 yards down the fairway. I recorded a 5 on my scorecard and considered myself “above average” for one hole! There is a little trouble down the left side at the par 4 finishing hole. Another large green that slopes from back to front and another par to complete my round with five straight pars. Ace: First, let me thank Karen for talking me into stopping to play in what looked like a rainy day. 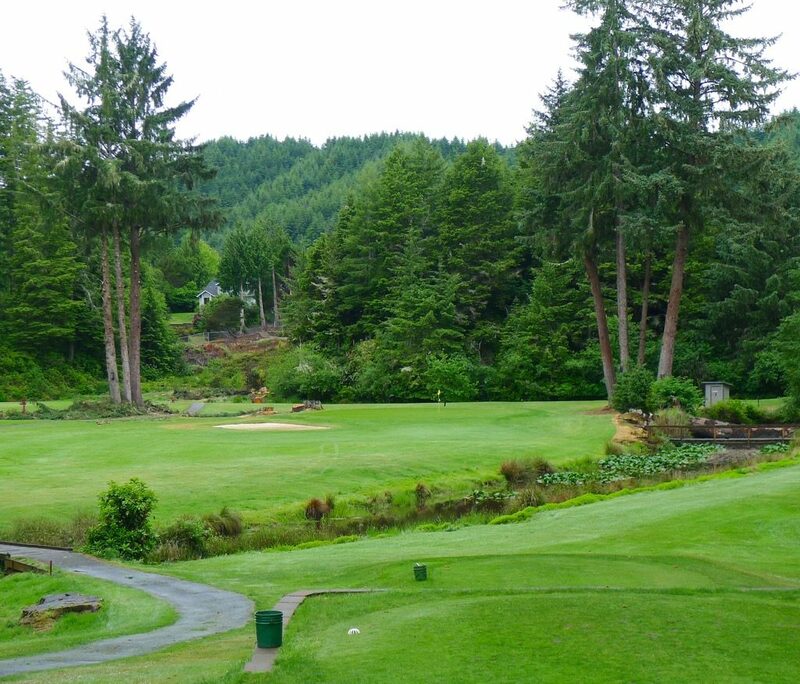 Second, thanks to my new friend, Dan, at Hidden Valley Golf Course in Cottage Grove, OR for suggesting this course. It was not on our original agenda. Third, we both thoroughly enjoyed the course. It was in outstanding shape – both the fairways and the greens. 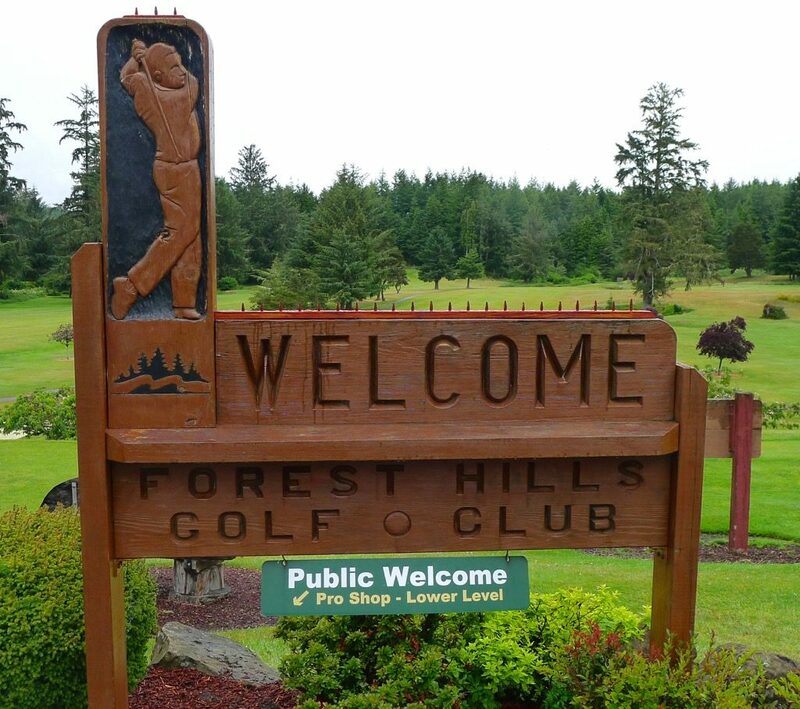 Forest Hills Country Club was a great stop on our Oregon swing and a fantastic warmup to the trip down to Bandon Dunes. If you are looking for a quick stop before heading south, give them a visit.